Yogi Bhajan is a Fake. 1. My name is Pamela Dyson. I currently reside on the island of Maui, in Hawaii. 3. During the time that I was a follower of Bhajan, I worked for Bhajan personally, as well as for the Sikh Dharma Brotherhood, the 3H0 Foundations the 3H0 Foundation of New Mexico, the corporation sole and the rest of Bhajans corporations. 4. When, as a follower and employee of Bhajan, I moved into his home in New Mexico in mid-1969, I was made a member of Bhajans Secretariat, which is Bhajans staff of female assistants. When I first became a member of the Secretariat, there were only two members, myself and another woman. The Secretariat later grew to approximately twelve members. 5. Ultimately, in 1974, I became President and Secretary General of the Sikh Dharma Brotherhood and Administrative Director of the Secretariat. I was also VicePresident of the 3H0 Foundation. I was, by virtue of these offices, also a member of the Khalsa Council. I held these positions until I left Bhajans organization in 1984. 6. Among my duties were oversight of the administration of the Secretariat, planning and executing the Khalsa Council meetings, oversight of the accounting departments that 1~andled all of the corporations ledgers, and oversight of the maintenance and development of all of the properties and assets of the corporations. I was also the editor of Beads of Truth, a twice-yearly publication of the 3H0 Foundation, and I was a high minister of the Sikh faith (Mukhia Sardarni Sahiba), whose duties included such things as spiritual counseling and the performance of weddings between followers of Yogi Bhajan. 7. During the time that I served the defendants in these capacities, I understood the Sikh Dharma Brotherhood to be a religious organization, and the 3H0 Foundation to be an educational organization. 8. I was instructed, by Bhajan, as well as by Bhajans legal advisers, that the 3H0 Foundation was a non-profit corporation, formed for the purpose of promoting and teaching the Kundalini yoga techniques of Yogi Bhajan, including exercises, meditation, chants~ diets and other yoga principles. These practices were explained to me to be based on scientific principles, and not on any articles of the Sikh faith. It was advertised by those of us working with 3H0, at Bhajans direction, that Bhajan and Bhajans students would teach these techniques, for a fee, to the general public. 9. By virtue of my various positions within the organizations, I was well acquainted with the mechanics of the organizations, as well as their by-laws, and stated goals, purposes and objectives. 10. Throughout my tenure with Bhajan, I was told by Bhajan, as well as accountants and attorneys working on behalf of Bhajan and the corporate entities, that the 3H0 Foundation and the Sikh Dharma Brotherhood were separate to the government, and must always be presented to the public as separate entities with different functions. 11. The Sikh Religion was not practiced through the 3H0 Foundation, and the 3H0 Foundation did not function as a religious organization. A deliberate effort was made to promote the distinction between 3H0 and the religious functions of the Sikh Dharma Brotherhood. 12. At the time, I believed that these two organizations were separate and distinct in purpose as well as function, and I always endeavored to act according to this belief in all my administrative dealings with the organizations. 13. I am certain the Sikh religion, as practiced during the time that I followed Bhajan, did not involve the practice of the Kundalini yoga or Tantric yoga that Bhajan taught. One could be an observant member of the Sikh religion without practicing yoga, although, due to Bhajans personal influence, Kundalini yoga and Tantric yoga were frequently practiced by Bhajans followers. Conversely, one could practice Kundalini or Tantric yoga without believing in the Sikh religion. 14. As a plaintiff, I know that attorneys for the defendants have told the Court that the practice of yoga, and the various diets, exercises and chantings I refer to in my Complaint, are all part of the practice of the Sikh religion. This is incorrect, at least for the period of time that I was involved with 3H0 and Sikh Dharma Brotherhood. I did not regard my yoga practice as a practice of the Sikh Dharma. 15. 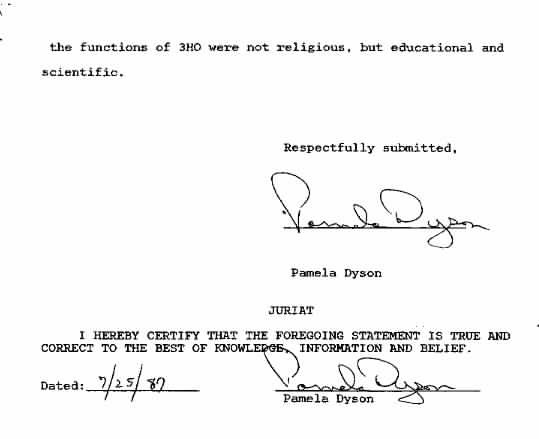 As a plaintiff, I also know that attorneys for the defendants have told the Court that the business of the 3H0 Foundation was religious in nature. This is incorrect, at least for the period of time that I was involved with 3H0 and Sikh Dharma Brotherhood. In the past, these same defendants consistently maintained that all religious function was singularly the province of the Sikh Dharma Brotherhood, while the 3H0 was to be an educational and scientific organization. These distinctions were repeatedly made by these defendants. the functions of 3HO were not religious, but educational and scientific. CORRECT TO THE BEST OF KNOWLEDGE, INFORMATION AND BELIEF.